Ed: I wrote this post originally on my blog RelativelyCurious in response to the story posted here about the dairy farm horses, and realized (seven years later!) that it’s definitely a found family story. My last blog post started a lot of family discussion as dad tried to locate pictures of the white percherons. My dad, now 85, grew up on the dairy, and my eldest cousin, Ann, spent a lot of time there when she was growing up also. 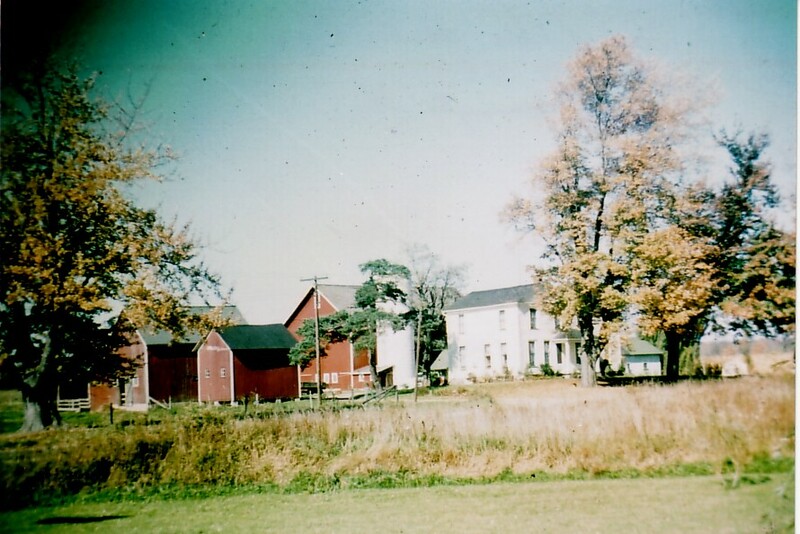 Their recent correspondence, spurred by a photo of my dad’s sister Ann, is worth sharing – a small glimpse into farm life. 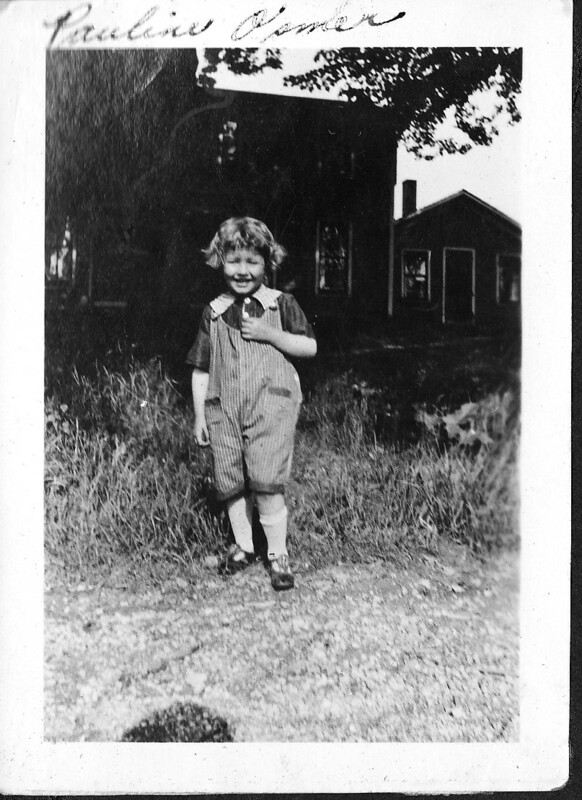 Ann: While I was looking for the horse picture, I came across this picture of mom when she was small. Is the house in the background the farmhouse? I don’t think I have ever seen a picture of the house before the north part was torn off. I can remember the inside of that room, but not the outside. I think we only used the kitchen in the summer, and then used the big room for a dining room and kitchen combined in the winter.Dad: The North wing of the house was originally a local cheese factory that the previous owner had moved and attached to the main house. The first room as you entered the front door (shown in the picture) was a dining room where we fed the thrashing crews a couple of times every year. Beyond it was the kitchen (under the chimney shown in the pic) with the cast iron wood burning cook stove under which you got your head caught while trying to catch a cat or retrieve a ball. Mom, or maybe Dad and I had to lift the stove a few inches to get your head loose. Do you remember that? Ann: I do remember getting my head caught under the cookstove, but the way I remember it is my whole body was under that stove. I remember looking out from under that stove, and it probably was just my head. I remember that someone got a board and pried up the stove so I could get out. I know grandma did have an oil stove that she cooked on, and I remember having a long table that they put the dishpan, rinse pan, and a drainer. I don’t remember having a sink. I also remember having a slop pail where they threw the dishwater. There was a big heating stove in the room that ended up being the dining room. I’m pretty sure that was the only heat we had until they got the furnace. It seems like grandpa took the stove out in the summer and then put it back in the winter. Dad: Beyond the kitchen was a storeroom which had a corner closet where our toys were kept. On the outside of that room was the woodshed and a porch off the kitchen which led to the cistern and to the stairs down to the cellar where we cooled our food in the summertime. Mom used to feed the cats and kittens on the porch so there was always a cat or two waiting to be fed. Mom’s daily routine was to save a large pan of milk from the milk house and take it to the cellar to keep it cool. Occasionally she would back out the door with the pan of milk and as she cleared the screen door and turned around, she would step on a kitten which screamed, followed by Mom’s scream and we would have another day with no milk. 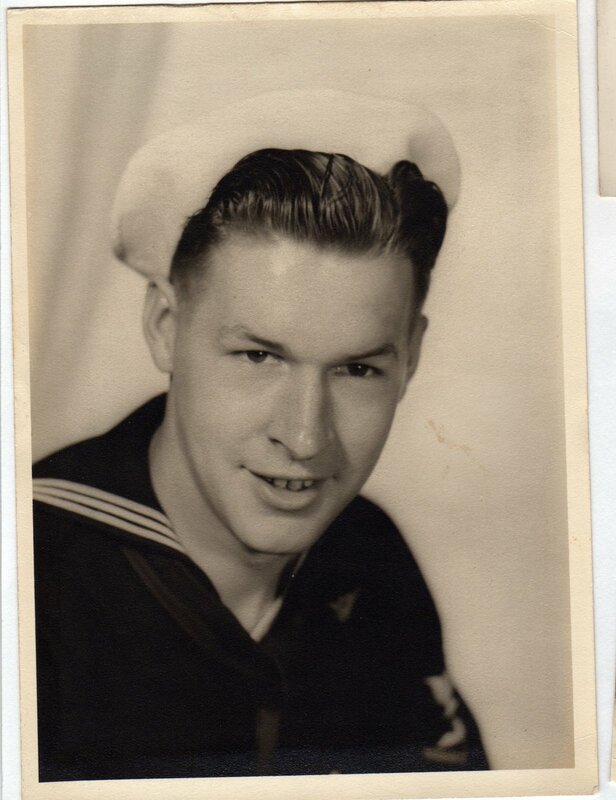 Regarding the kitchen use, I left in Jan of 43 for the Navy and I think Mom was cooking 3 meals a day all year on that kitchen but she may have switched to a kerosene stove. I’m getting a little hazy on the details of that period. Ann: I can remember Tom Franks doing the remodeling, and he ate lunch with us and told a lot of stories. I can’t remember what it was he told us, but I guess I thought it was strange so I asked grandma about it. She told me that he told “yarns.” I had no idea what a yarn was. I can also remember that during the war, they had what they called “blackouts.” Everyone was supposed to turn all the lights out, so in case we were attacked the enemy couldn’t find us. A man used to walk past each house to see if any lights were on. Grandpa used to listen to the radio, and he would hold a paper or cardboard in front of the radio so the man couldn’t see the light from the dial. My grandfather (dad’s dad) died in 1969 and the farm was sold shortly after that. 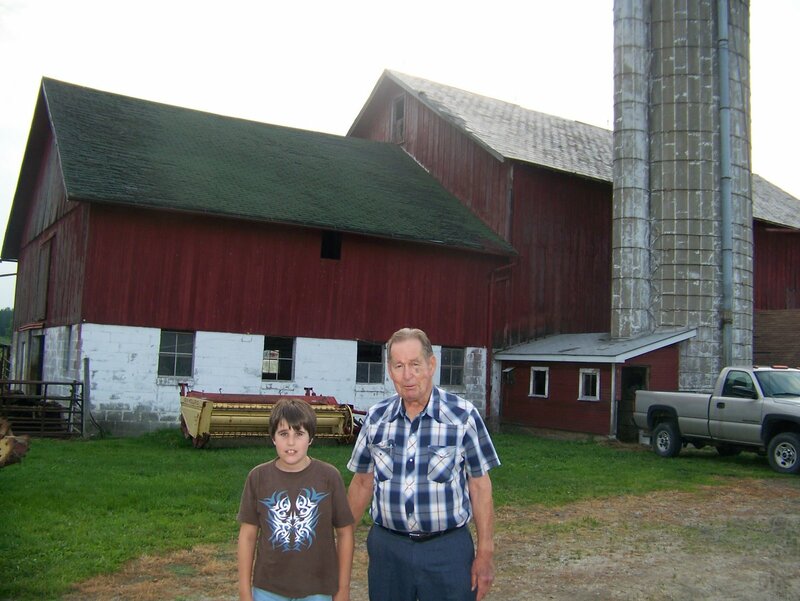 My dad, my son and I were back in Ohio this past summer  and were able to visit the old farm, which has changed quite a bit. But one thing remained the same – there were cats everywhere!